The Blessed Virgin Mary appeared to two young children, Melanie Mathieu and Maximin Giraud in LaSalete, France in the year 1846. At the time there was corruption, self-indulgence, greed and worldliness. 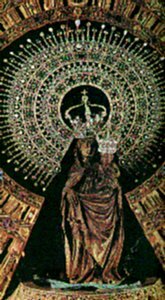 Our Lady appeared sorrounded by light, she was weeping and gave warnings about the chastisements that would hit the world. She complained about people not keeping the commandments, about the apathy for religion and she disclosed the punishment that people would receive if they did not amend their lives. In 1851, five years after the apparitions at La Salette, the Bishop of the diocese, as well as most of the clergy declared the apparition as authentic and divine in origin. "This place is to be my house, and this image and column shall be the title and altar of the temple that you shall build." The jasper column and the wooden statue can still be seen on special occasions at a church that houses them. About a year after the apparition James arranged to build a small chapel in Mary's honor, the first Church ever dedicated to the honor of the Virgin Mary. After James returned to Jerusalem, he was executed by Herod Agrippa in about 44 AD, the first apostle to be martyred for his faith. Several of his disciples took his body and returned it for final burial in Spain. The local queen, observing several of the miracles performed by James' disciples, converted to Christianity and permitted James' body to be buried in a local field. Eight centuries later, a cathedral in honor of St. James was erected after his gravesite was rediscovered by a local hermit. The hermit found the burial site after noticing an unusual star formation. The site for the cathedral was called Compostella (starry field) and it is a major pilgrimage site to this day. "Let all who are in any way distressed or in need seek me there in that small house that you maintain for me at Walsingham. To all that seek me there shall be given succour." In the Middle Ages, Walsingham became one of the greatest pilgrimage sites in all of Europe. A church was constructed around the house to protect it from the elements. Many English kings conducted pilgrimages to Walsingham. The last of these was Henry VIII, who made three pilgrimages to the site before breaking with the Catholic Church in 1534 and forming the Church of England. Henry ordered the destruction of all Catholic shrines and places of religious worship. The Walsingham church and house were destroyed in the rampage of destruction that occurred. The statue of Mary that resided in the house was burned several years later. It was not until the 1920's that Walsingham' Holy House was rebuilt at the direction of Alfred Patten, an Anglican priest. The Slipper Chapel, named in honor of those who - in the Middle Ages - removed their shoes to walk barefoot to the Holy House, a small Catholic chapel located near the Holy House had managed to escape the destruction of the Reformation. This chapel became the Catholic Shrine of Our Lady in England. Both sites have become active pilgrimage sites once again. Domingo de Guzman was a Spanish preacher who went to southern France to oppose the Albegesian heresy which was spreading rapidly. In 1208, while he was praying at a chapel in Prouille, Mary appeared to him and gave him the Rosary and urged him to preach the Rosary to all people as a remedy against heresy and sin. The factual basis for this series of events is questionable. Nonetheless, Domingo (Dominic) founded an order of preaching friars who went on to halt the Albegesian heresy and establish monasteries all over the world. The order is commonly referred to as the Dominicans. 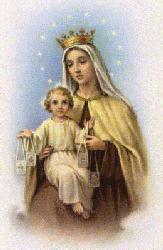 "My beloved son receive this scapular for your Order. It is the special sign of a privilege which I have obtained for you and for all God's children who honor me as Our Lady of Mount Carmel. Those who die devotedly clothed with this scapular shall be preserved from eternal fire. The brown scapular is a badge of salvation. The brown scapular is a shield in time of danger. The brown scapular is a pledge of peace and special protection, until the end of time." After this apparition, Friar Stock went on to establish Carmelite communities near university towns in England, France and Italy. He became the Superior-General of his order several years after the apparition. Until very recently, the brown scapular was one of the most widely used religious symbols of personal dedication to the mission of Mary found in her last recorded words in the Bible (John 2:5). 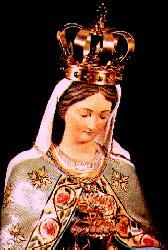 The promotion and use of all types of Marian devotional symbols has declined dramatically since the 1960's.